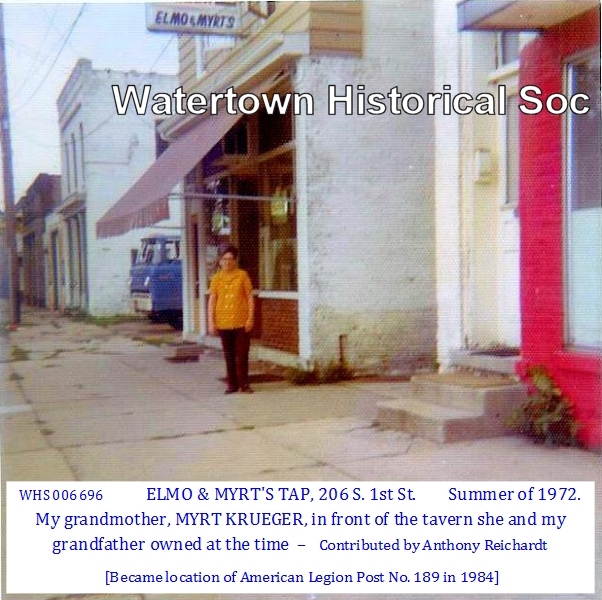 The Watertown American Legion began in 1919 with Dr. A. F. Solliday as first commander. Later, the organization was named the Sgt. 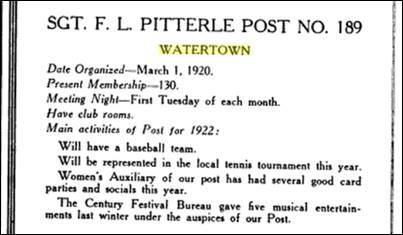 Frank Pitterle Post #189 in honor of Pitterle [1896-1918], who was the first Watertown man killed in action during World War I. At the conclusion of World War II, Beaudoin was added to the post in honor of the last town casualty in World War II. The American Legion was founded in Paris at the end of World War I. The First Street location is the Legions fourth headquarters since its inception. Up until World War II the Post was without a main office and members met in various locations throughout the city. But near the beginning of the war, the Legion started to gather at the old Armory and early high school building on Main St, later the Heritage Inn. Paris, 1919: A group of 20 officers who served in the American Expeditionary Forces in World War I were asked to suggest ideas on improving troop morale. Lt. Col. Theodore Roosevelt Jr. proposed an organization of veterans — The American Legion. The original purpose of The American Legion was to preserve the memories and incidence of the United States’ association in the great war, helping those who had served in foreign wars to reintegrate into their hometowns while remaining connected to those with whom they had served abroad. The Legion served as a support group, a social club and an extended family for former servicemen. After two planning caucuses held by a committee of officers who had the confidence and respect of their military comrades, a constitution was designed to govern the group and begin work on its programs of relief, employment and Americanism. The organization was chartered by Congress Sept. 16, 1919. And then . . . The American Legion Auxiliary is a grassroots organization. Clearly summed up, the definition of grassroots is: people who are drawn together by something they have in common that has both personal and community consequences, and grant themselves the authority to solve the problem they are facing or create the future they desire. Women wear a number of hats — daughter, wife, mom, friend, mentor, caretaker, volunteer — and the list goes on. What do hats and grassroots have in common? Step back in time for a moment. The year, 1919. Women, fashionable hats and all, were left on the home front while their men were going off to war. Those concerned women embraced the day-to-day responsibilities of life, and soon became aware of the plight of fatherless families and the needs of returning veterans, vowing to continue their supportive role. With that empowering dedication, in less than a year, 2,342 units of the Women’s Auxiliary to The American Legion had been organized in more than 45 states. Now, nearly a century later, the American Legion Auxiliary continues to champion for veterans, the military and their families. All from a willingness, no — a need to do something, and look what happened! The American Legion Auxiliary is about 800,000 strong and working to grasp the million-member mark. Styles have changed through the years, but the mission of the American Legion Auxiliary remains constant, as does that very devotion that sparked the organization! The American Legion Auxiliary is the world’s largest women’s patriotic service organization, with its mission to support The American Legion and to honor the sacrifice of those who serve by enhancing the lives of veterans, military and their families, both at home and abroad. For God and country, we advocate for veterans, educate citizens, mentor youths and promote patriotism, good citizenship, peace and security. Beloit, Wisconsin, August 24, 25, 26, 1922. Edwin H. Kaercher, 46, residing at 910 Western Avenue, died at St. Mary’s hospital. Mr. Kaercher, who was auditor and office manager for the G.B. Lewis company, was a World war veteran, serving with the original Company E of this city. He was a past commander of the Sergt. Frank L. Pitterle post of the American Legion and was president of the Last Man’s Club made up of men in Company E.
A solemn requiem funeral High Mass, a moving mix of religious rite and military aspect, was held at St. Henry’s for Father Henry Novotny. 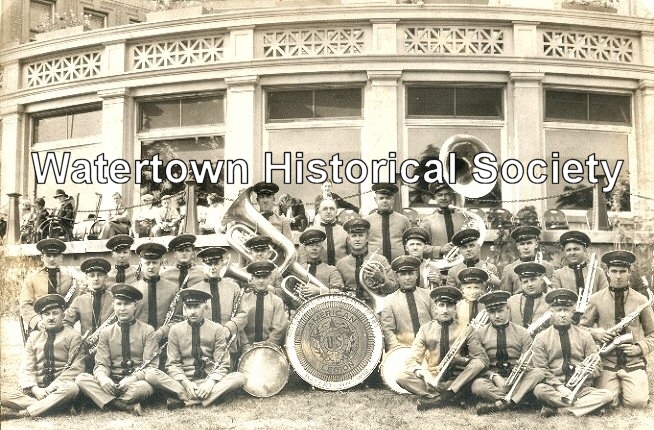 The night prior to the funeral, his earthly remains were brought to Watertown and taken directly to the church; members of Company E, with whom Father Novotny served in World War I, and the Sgt. Frank L. Pitterle post of the American Legion were among those who paid him tribute. Prayers were said by the differing groups that assembled and a guard of honor and an all-night vigil were maintained throughout the night by members of the Holy Name Society of the parish. 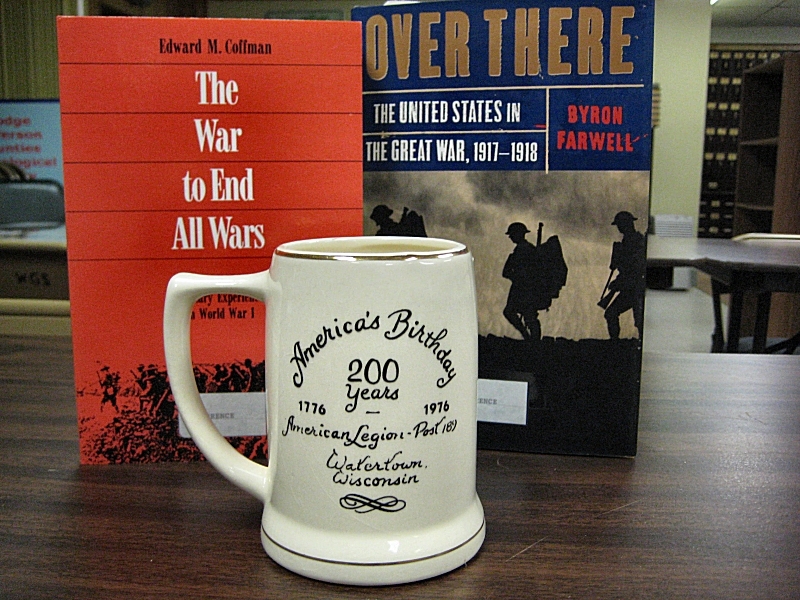 Many old friends and acquaintances, old classmates, and buddies of WW I filed past the bier. 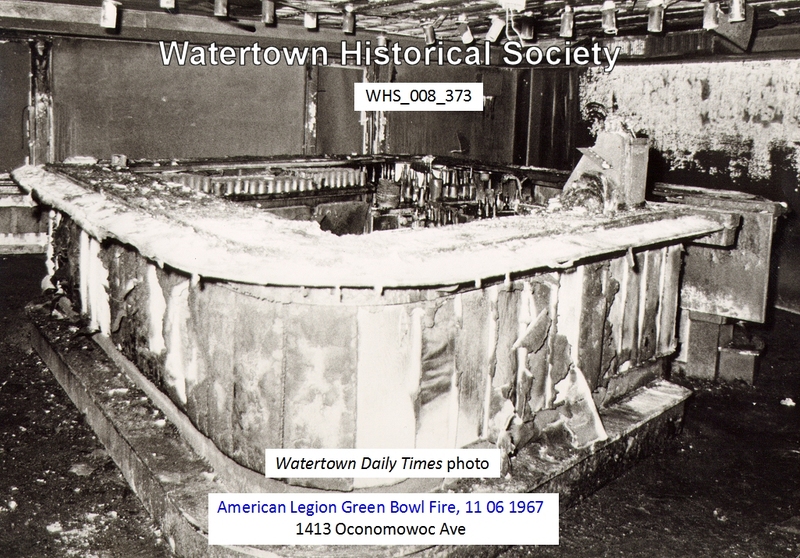 In 1948, the Legion purchased the Green Bowl Tea Room, formerly the Wenzel Prochazka House and converted it to the Legion Green Bowl Supper Club. 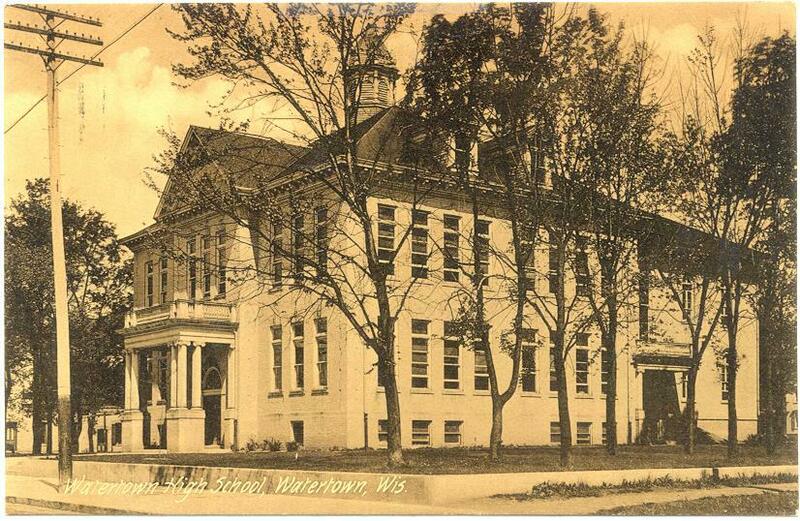 It was located at 1413 Oconomowoc Ave which was laid in 1912 and was the first cement street in Wisconsin. Twenty-five years later the Legion sold the club to George Lindberg, who then operated it as Lindberg's By The River. 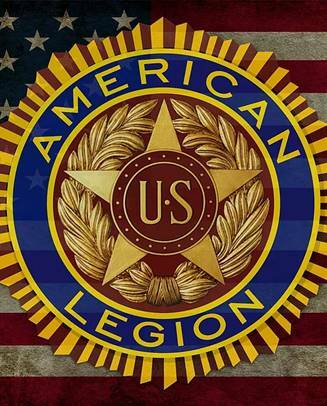 The American Legion Band was formed June 14, 1949. 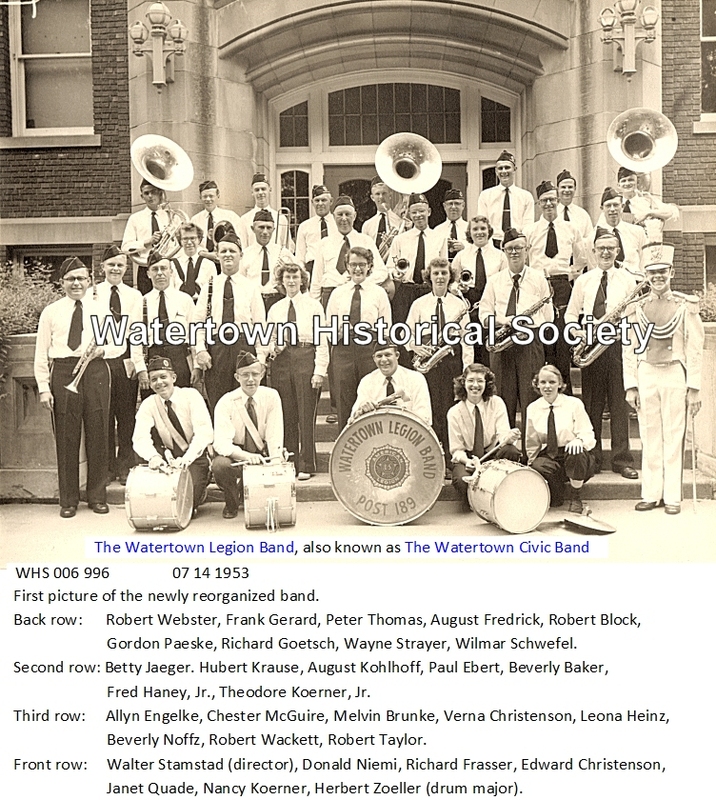 Members included some from the original Watertown Cavalry band. Their first performance was August 20, 1949 under the direction of Frank Koenig. The turnout was estimated at 1500 persons who gave generous applause. 03 24 The Pitterle-Beaudoin Post No. 189, American Legion, is now far enough advanced with its plans to enlarge its property, the Green Bowl to petition to the City Council to have the area rezoned from residential to commercial in order to begin construction. The plans have been underway for the past several months and have been checked with state authorities. The Legion's petition will be presented to the City Council this evening and following the customary procedure will be referred to the City Plan Commission after which a hearing will be scheduled before any action is taken. 07 17 New officers of the American Legion Firing Squad announced today by officials of the Pitterle-Beaudoin Post No. 189, are: Ronald Millin, commander; Delbert Barner, adjutant; Roger Wilkes, first vice commander; Leroy Draves, second vice commander; Harvey Duehring, historian; Donald Lenius, finance officer; Edward Kuenzi, drill sergeant; Laverne Wanke and Lester Else, sergeants at arms. 05 03 Work on the Green Bowl addition is to start next Monday, it was announced today by the Pitterle-Beaudoin Post No. 189, American Legion, owners of the property. Walter Otto, Watertown contractor, has been awarded the contract, having submitted the bid which the committee recommended for acceptance. The project has been approved by the membership of the Legion. The plans for the addition call for a large new structure for Legion purposes and there will also be new and enlarged rest room facilities. There will also be some improvements in the present quarters. The Pitterle-Beaudoin Post No. 189, American Legion, which each summer sponsors the largest celebration at Riverside Park, the Fourth of July festivities, today began to assemble its forces to seek defeat of the April 2 referendum which will decide whether the sale of beer is to be continued in Riverside Park and other public parks in the city. The Legion has made it clear that it wants to continue sponsoring the celebrations but cannot do so if its largest revenue raising source at the park is halted. 06 19 Newly elected officers of the Pitterle-Beaudoin Post No. 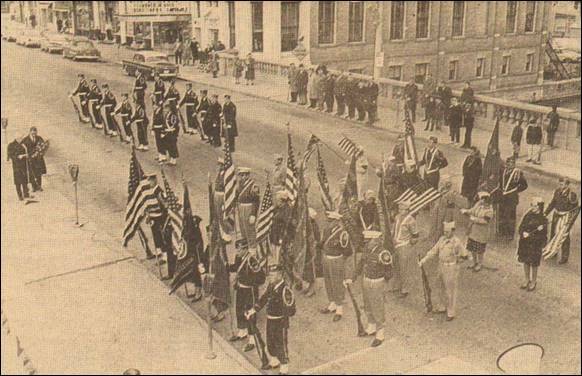 189, American Legion were announced following ceremonies at which they took over their duties. Officers are: Harold Wilde, commander; Tom Darcey, first vice commander; Howard Klug, second vice commander; Arnold T. Jorgenson, finance officer; Delbert Barner, chaplain; Conrad Ott, historian; Lester Else and Bert Sterwald, sergeants-at-arms; Harvey Duehring, trustee for three years; William Connor, service officer. A flag bedecked Watertown, with United States flags flying at half-staff from buildings, today joined in the almost worldwide tribute to the memory of President John F. Kennedy whose funeral was held in the nation's capital. The Watertown ceremonies were held on Cole Memorial bridge at 10 a.m., the starting time for the funeral cortege in Washington. Participating here were Mayor Robert White who dropped a memorial wreath into the Rock River, a prayer was recited by the Very Rev. A. J. Herrmann, pastor of St. Henry's Catholic Church and a firing squad from the Pitterle-Beaudoin Post No. 189, American Legion took part. There also were other local veterans organizations represented at the ceremony. The Legion was again without a main headquarters until December 28, 1984 when it purchased its present home, formerly Waldoch's, at 206 South First Street. The Legionnaires and Auxiliary have completely renovated the former tavern where the Post holds meetings and store equipment such as wheel chairs, walkers and hospital beds. The Legion holds a liquor license for the building but it is not open to the public. 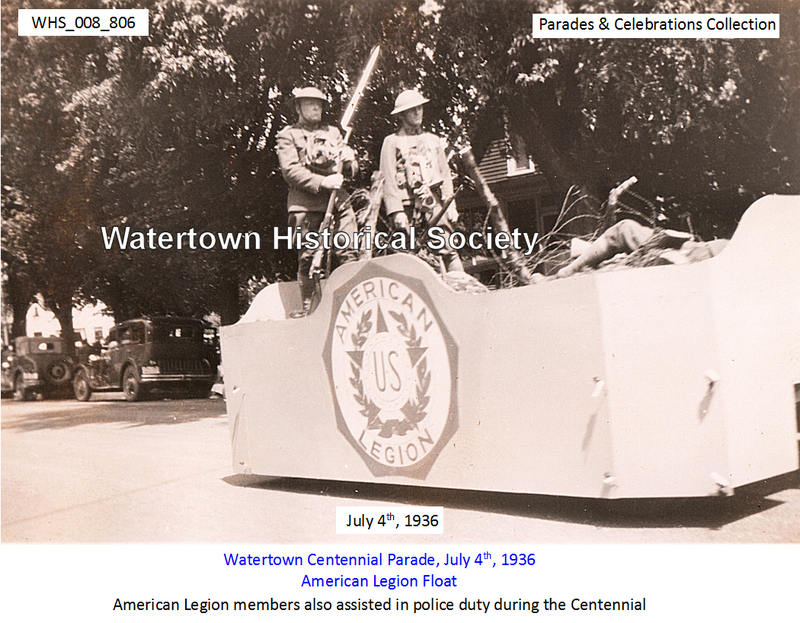 In 1996, the City of Watertown and the American Legion Pitterle-Beaudoin Post #189 hosted Watertown's 178th annual city celebration of the Fourth of July. The parade draws a throng of people to the business section on Main Street as well as along the parade route to the Riverside Park where the Legionnaires and Auxiliary offer food and drinks and music. Fireworks are scheduled at night. Post #189 is instrumental in observing Veterans Day along with various other organizations. Local veterans groups met at the Heritage Inn and march in a parade beginning at 10:30 a.m. and continue down Main Street to the Main Street bridge where a brief ceremony is held to honor all military people who did not return from war. This replaces the Armistice Day celebration of years ago commemorating the date and time of the end of World War I as silence fell over "No Man's Land" in Europe at 11 a.m. on Nov. 11, 1948. In 1954 President Dwight Eisenhower signed a bill proclaiming Nov.11, Veterans Day instead of Armistice Day and asked Americans everywhere to dedicate themselves to the cause of peace on this national holiday. Since that time, World War II, the Korean War and the Vietnam War have brought more veterans into existence. About 1500 American Flags are placed on area graves of military veterans before Memorial Day and are removed shortly after Labor Day by a few Legionnaires under the direction of Wes Altwies. The larger cemeteries include: Watertown: Oak Hill, Moravian, St. Bernards , St. Henrys , Immanuel Lutheran ; Ixonia: Glenview Gardens . Three of the 21 cemeteries only have one flag each. The flags are placed in special metal holders called “stakes”. Stakes in use include World War I, World War II, Korea, Revolutionary War, War of 1812, Mexican War, Vietnam, Cuba, the Civil War and two in Watertown from the Indian War. 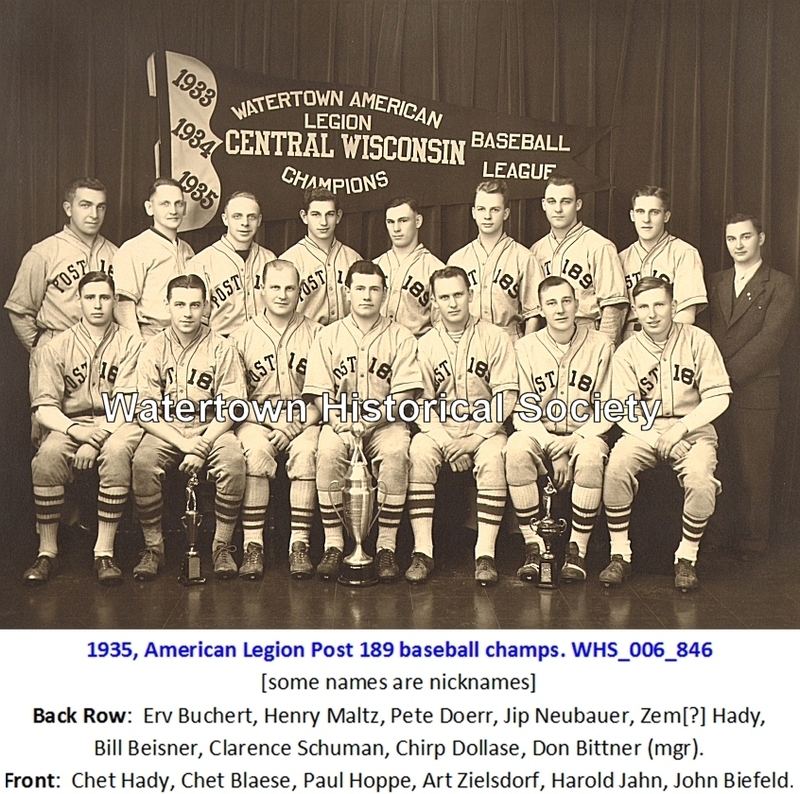 The Watertown American Legion baseball team competes for the State AA tournament. The colors of red, white and blue have been emerging on graves in cemeteries in Dodge and Jefferson counties as a visual reminder of veterans and the sacrifices they made to keep this country free. The appearance of the flags is a spring ritual in 21 cemeteries in this area, thanks to the efforts of two volunteers from American Legion Post 189 and its auxiliary. Placement of the flags is a long-standing ritual perpetuated by Wesley and Gladys Altweis, the two volunteers who visit the cemeteries each year before Memorial Day and again after July 4. The flags are stored until the following spring, but the patriotism evoked by the symbol of freedom is never-ending for Altweis. A committee from Post No. 189 consisting of Wesley Altwies, Jerry Peters and Howard Hilgendorf placed 2,272 flags on the graves of veterans in the area to honor their sacrifices. Nancy A. Schultz, 83, of 18781 Hoover St., Salinas, CA, died March 6, 2007, at Salinas Valley Memorial Hospital in Salinas. Nancy was born Dec. 14, 1923, in Melbourne, Victoria, Australia, daughter of Terence and Myrtle Bruun. She married Harold Schultz of Watertown, Wis., in Melbourne in 1943. Harold preceded her in death March 12, 2003, in Haines City, FL. Nancy came to Watertown from Australia in June 1945. 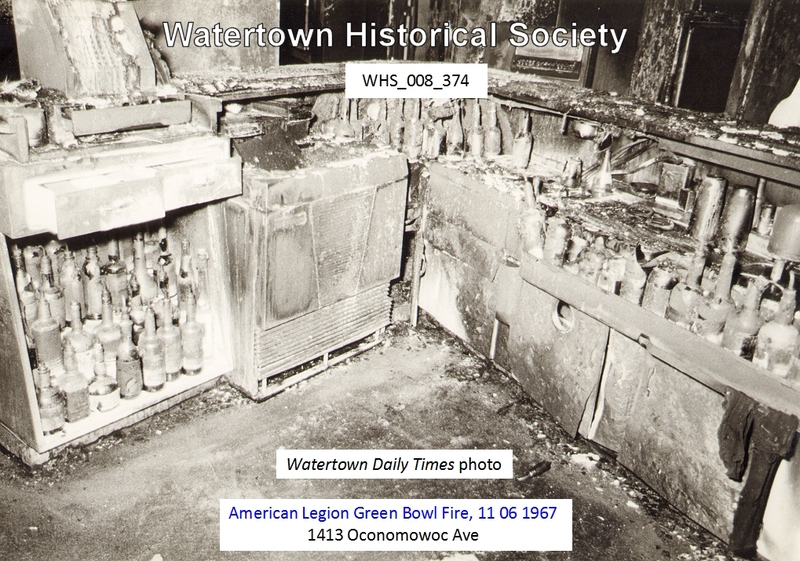 Nancy and Harold were managers of the former American Legion Green Bowl in Watertown and Nancy had worked for several local restaurants. Surviving are daughters, Karren (Charles) Wolfram of Watertown, Sandra (Tony) Ziganay of Salinas and Patricia Schultz of Sullivan, WI. Wtertown resident Bill Connor was named the 2008 Legionnaire of the Year at American Legion Post No. 189’s 90th birthday celebration that was held this past weekend at Turner Hall. Connor has been a member of Post 189 for 54 years, serving as post service officer and first vice commander. He served as post commander from 1960 to ’61, the same time his late wife, Mary, was auxiliary president. Connor and his wife are the only married couple in the history of Post 189 who served as commander and president at the same time. Members of Pitterle-Beaudoin Post No. 189, American Legion, have been busy this week placing American flags on the graves of veterans in all local and area cemeteries. Placing the flags on the graves of veterans on Memorial Day week has been a tradition of the local Legion Post. In recent years the flag holders have been moved from the ground near the grave to the base of the headstone markers so they are less likely to be damaged by lawn mowing and maintenance crews. The regular monthly meeting of American Legion Post No. 189 was opened by Cmdr. Ken Zindars with the Pledge of Allegiance and the preamble to the Legion constitution. The main order of business for the evening was the installation of officers for the 201617 session. Taking the gavel from Zindars was new Cmdr. Ronald Krueger. Also sworn in were 1st Vice Cmdr. Robert Saeger, 2nd Vice Cmdr. Kenneth Wzorek, Adjutant Larry Schultz, Chaplain Ward Genz, finance officer Roger Herbert, service officer Emily Derbas, Judge Advocate Dan Stratman, historian Douglas Clemmons, and Sgts.-at-Arms William Connor, Louis Checkai and William Rex. Wzorek and Derbas are new to the board this year. Dodge County Cmdr. Julie Muhle and Pat Sukowski, 2nd District chairman of A& G Testing, presided at the ceremonies. Genz reported sending get well cards to Dan Weidenhoeft, Pedro Perez and Don Meier. A sympathy card was sent to the family of Dr. Robert Liners. Blue Star Banner Chairman Lavern Schumann reported giving a Gold Star banner to Lois Bloedorn, sister of Russell Beaudoin who was killed in action on an aircraft carrier during World War II and buried at sea. Beaudoin is one of the servicemen after which Post No. 189 was named. Requests for membership to Post No. 189 were received from David Hulick, U.S. Navy, Vietnam era; Dennis Daley, U.S. Air Force, Vietnam; Reginald Ingersol, U.S. Marines, Vietnam; Roland Marmes, U.S. Navy, Vietnam; Daniel Mejia, U.S. Army, Vietnam; Mike Palm, U.S. Army, Vietnam; and Brian Joyce, U.S. Army, Persian Gulf era. All were unanimously accepted and welcomed to the post. New commander Krueger presented past commander Zindars with a plaque honoring him for his three years of service as post commander. Plans are underway for the annual Fourth of July celebration, which will be held at Riverside Park. The event will be a three-day affair this year, with live music starting Saturday afternoon, July 2, and continuing through Monday afternoon, July 4. The fireworks will be held Sunday, July 3, with July 4 as a rain date. There will be new activities for young and old, and all are encouraged to attend and support their local veterans community. It was also announced that Derbas, a registered nurse by profession, will donate her time once a month to assist any veterans with health concerns. This month she will be at the post on June 23 from 11:30 a.m.-1:30 p.m. All time with Derbas will be done in strict confidentiality. The recent military show at the Watertown Municipal Airport conducted a raffle and an airplane ride, which was won by Bernice Baumann. The American Legion Auxiliary (ALA) was formed nearly a century ago, in 1919, when women were left behind on the home front while their men were going off to war. Those concerned women embraced the day-to-day responsibilities of life and soon became aware of the plight of fatherless families and the needs of returning veterans, vowing to continue their supportive role. With that dedication, in less than a year, 1,342 Units of the Women’s Auxiliary to The American Legion had been organized in more than 45 states. And now, almost 100 years later, its members continue to support veterans and the military. The organization is nearly 800,000 strong and working to reach the million mark. Some of the programs of the ALA include Americanism, Badger Girls, Children and Youth, Community Service, Education and Scholarship, Juniors, Legislative, Membership, Music, National Security, Past Presidents Parley, Poppy, Public Relations and Veterans Affairs and Rehabilitation. Unit 189 is one of eight units in Jefferson County. 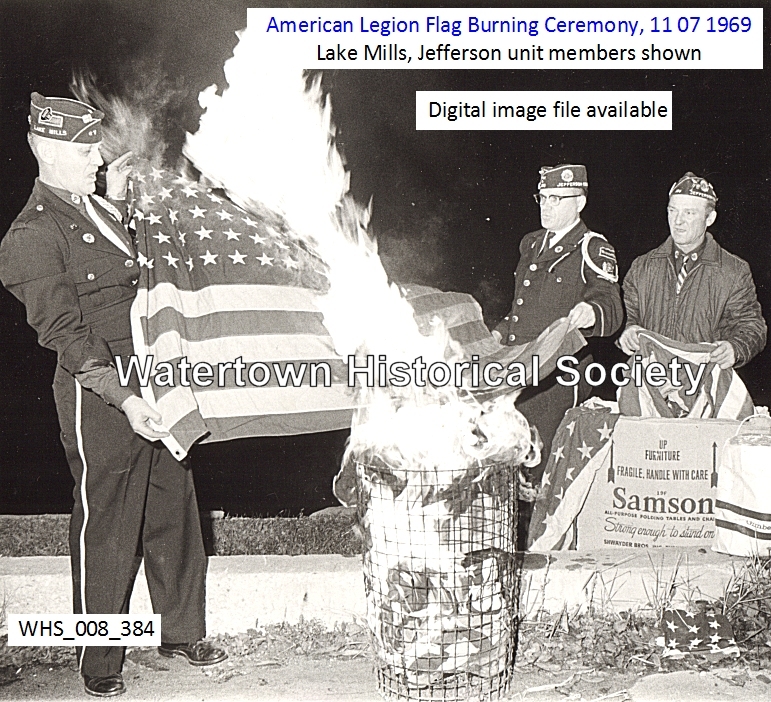 The other units are Fort Atkinson, Jefferson, Johnson Creek, Lake Mills, Palmyra, Sullivan and Waterloo. Six counties, Columbia, Dodge, Jefferson, Ozaukee, Sheboygan and Washington, form the Second District. Twelve districts cover 72 counties and comprise the Department of Wisconsin. The ALA is organized into 52 (state) departments, with one operating in each of the 50 states, the District of Columbia and Puerto Rico. Membership in the American Legion Auxiliary is limited to the grandmothers, mothers, sisters, wives and direct and adopted female descendants of members of The American Legion, and to the grandmothers, mothers, sisters, wives and direct and adopted female descendants of all men and women who were in the Armed Forces of the United States during any of the following periods and died in the line of duty during such service, or who, having received an honorable discharge, died after service: — Gulf War/War on Terrorism: Aug. 2, 1990, to date of cessation; Panama: Dec. 20, 1989-Jan. 31, 1990; Lebanon and Grenada: Aug. 24, 1982July 31, 1984; Vietnam War: Feb. 28, 1961-May 7, 1975; Korean War: June 25, 1950Jan. 31, 1955; World War II: Dec. 7, 1941-Dec. 31, 1946 and World War I: April 6, 1917Nov. 11,1918. The American Legion Auxiliary is the largest women’s patriotic service organization in the world. Its mission is to support The American Legion and to honor the sacrifice of those who serve by enhancing the lives of veterans, military and their families, both at home and abroad. For God and country, the auxiliary advocates for veterans, educates citizens, mentors youths and promotes patriotism, good citizenship, peace and security. American Legion Pitterle-Beaudoin Unit 189 officers for 2016-17 were installed at the unit’s June meeting. Officers include Karen Sherry, chaplain; Mary Petrie, president; Kathy Allermann, vice president; Sandy Sullivan, historian; Ora Kuckkan, treasurer; Rebecca Hoffman, secretary; Carol Peters, sergeant-at-arms and Jeanne Gillis, assistant sergeant-at-arms. Mae Wilkes, a past president, served as the installing officer. Jerome E. Peters, 74, of Watertown, passed away on Sunday, Feb. 12, 2017. Jerome Edward Peters was born on Oct. 31, 1942, at St. Mary’s Hospital in Watertown, the son of Oswald and Patricia (nee Simon) Peters. On Feb. 2, 1980, he married the former Debra Buchta at St. Mark’s Lutheran Church in Watertown. Jerry graduated from Watertown High School. He entered the United States Navy and served his country from 1960-63. He then was employed by Kinkead Plastics in Johnson Creek for 23 years, serving most of those years as foreman. He then purchased the former Bowl-A-Fun Lanes and became the proprietor of Jerry’s North Bowl and served there as proprietor for 17 years, at which time he retired. Upon his retirement, Jerry became very active in the American Legion Post 189. He was commander from 2007-13. Jerry was honored with having the Main Street Bridge named after him for one year for all his help in the community. He was also an active member of AARP Chapter 3056. Jerry was a member of St. Mark’s Lutheran Church. The American Legion Auxiliary Unit #189 donated $300 to the Watertown Fire Department towards the purchase of extrication equipment. The equipment is used to extricate victims that have been trapped in vehicles following collisions and other situations where victims need to be removed from equipment or wreckage. This donation was obtained through the American Legion Auxiliary Unit #189’s fundraising efforts. The newly installed 2017-18 American Legion Auxiliary Pitterle-Beaudoin Unit 189 officers are: Kathy Allermann, vice president; Ora Kuckkan, treasurer; Karen Sherry, chaplain; Carol Peters, sergeant-at-arms; Sandy Sullivan, historian; Rebecca Hoffman, secretary; Mary Petrie, president; Pat Benzel, past unit president and installing officer; Julie Wright. 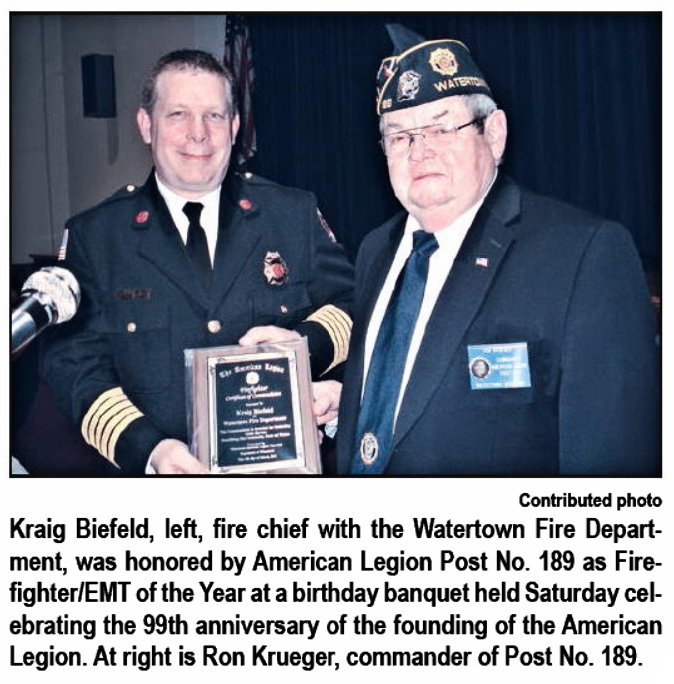 Fire Chief Kraig Biefeld was honored by American Legion Post No. 189 as Firefighter/ EMT of the Year at a birthday banquet held Saturday celebrating the 99th anniversary of the founding of the American Legion.